Yes, that is right, Hugo Chavez went to mass on the 24th and he made the first reading of the Catholic Mass, apparently the traditional one from Isaiah. 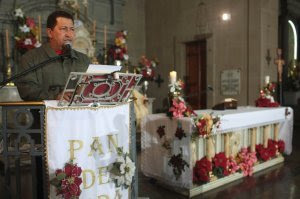 Of course, Chavez been Chavez it could not just be about a simple Xmas service. At the exit (or going there, I could not figure it out) he declared that Venezuela was doing fine in spite of the coming crisis. Probably his own version of a Christmas Miracle. But what was simply fabulous was that he took along with him most of his cabinet, including the minister for legislative decrees, Cilia Flores, formerly known as the president of the National Assembly. In attendance were also the two Arabic sounding members, Tarek and Haiman who until now we did not know whether they were Muslim of Christian (remember, there are many Lebanese, Syrian and Palestinian Arabic Christians). We still do not know since they might have been there for ecumenical purposes, and none of them, from Silly Flowers to Haiman knew the traditional mass responses. I could not find the video yet, and if someone finds it please let me know to post it, it is priceless. As an act of supreme hypocrisy from the man that insults continuously the Roman Church and who claims to belong to all sorts of religions it can hardly be matched. Chavez will really do ANYTHING to remain in the front news, even on Christmas Eve... Or as my father said, pardon my French "c'est incroyable que quelqu'un puisse se foutre de la guele du monde à ce point!". Not translatable, alludes to people constantly mocking you at incredibly high levels.